No, not the song, just the 12th day of Christmas as in The Epiphany or the Adoration of the Magi who came to Bethlehem 12 days After Christmas by following the comet and bearing gifts for the baby Jesus. Not something that is normally taught in America, or not as how I remembered it. January 6th, the 12th day after Christmas is a big deal in Europe. Actually, the night before, 11th night is a big deal with old folklore stories including a witch and gifts in a stocking, (kind of like combining Halloween and Santa together!) but day 12 is THE day. We’ve always been in France for Epiphany day so this was our first Italian celebration and wow is Florence the right place to be. It’s an entire processional of fully dressed and decked out people who are re-enacting the 3 Wise Men walking to the live Manger in central square Florence. The entire villages and royalty are represented in full period clothing, including Eagles, Owls, donkeys, goats and horses. It was site to behold! I think I prefer the parade to the cake! What are your thoughts? Enjoy our photos, it was a fun day and a wonderful new experience and such a great surprise. I love learning new traditions and history and who doesn’t love a parade?! What better way to spend your Sunday? How about a parade you didn't know was going to happen and you get front and center!? the 12th Day of Christmas is a big deal in Europe. 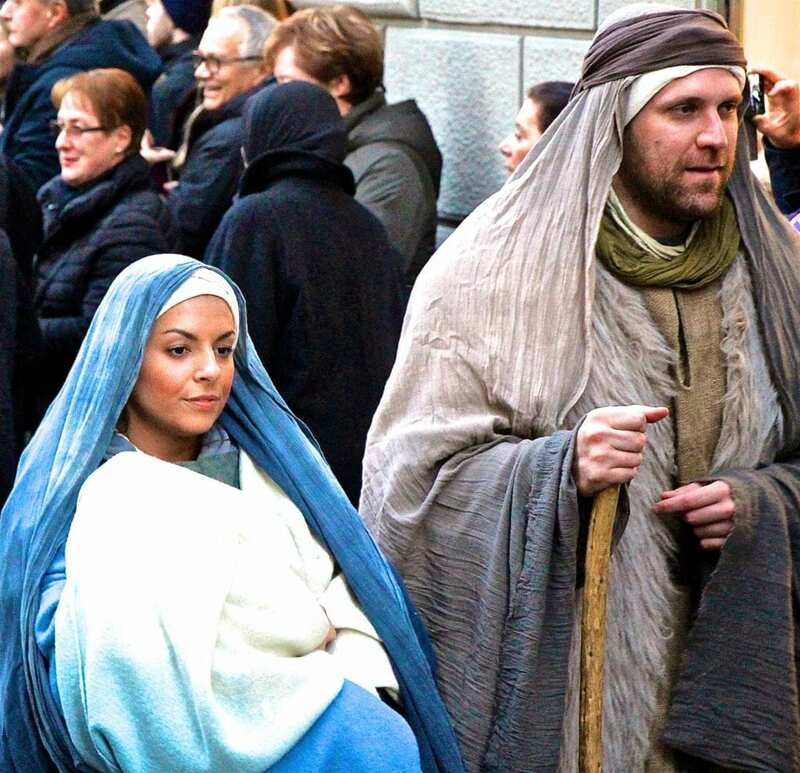 The timeline of the story of Bethlehem is quite different than some are taught. 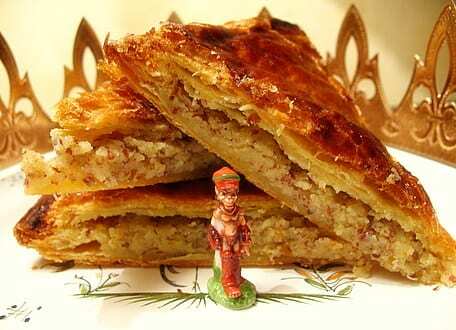 But on the 12th day after Christmas is when the wisemen arrive at the manger in Bethlehem bringing the gifts to Jesus. And in Florence, its a BIG deal, resulting in a huge parade from one side of Florence to the city center and back. And it was a gorgeous but very cold day. After walking all the way from Pitti Palace to the Duomo city center, the parade became the presentation of the gifts to the live manger of Jesus/Mary and Joseph. the square was packed and no way to get in front so I enjoyed my view of the fabulous bell tower of the Duomo. There was alot of standing around as the priest talked, awards were giving out and more presentations all in Italian; so, for a girl who can't speak YET, it was great people watching instead. After a long while, the balloons were let go and we all hoped the parade would restart as its getting really cold! And the parade people, all in amazing costumes of period clothing were ready to get back to marching. Not sure who he was and why he was awarded, but as I said, the view was good even though I couldn't see the main event!!! and let the parade begin! The flag of Florence front and center as the parade began. 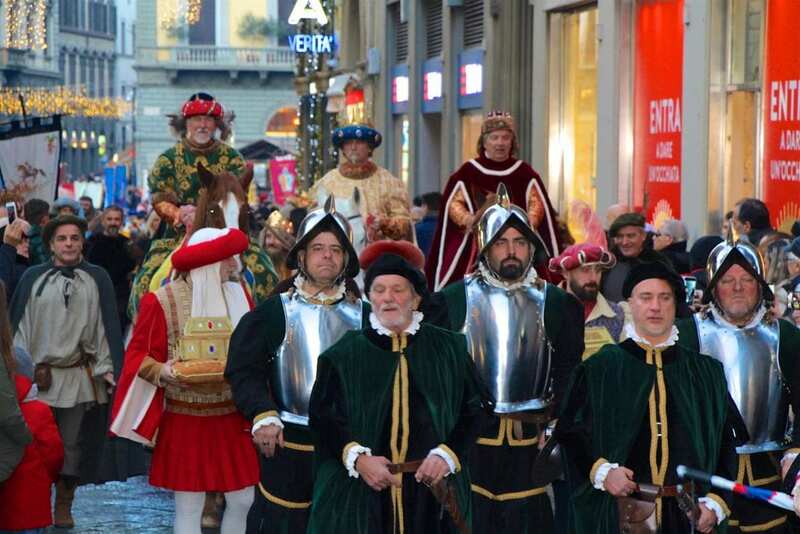 The Florence parade has been going on since 1417!! When the clothing would have not been costumes, it would have been just normal clothing! At one time, even the famous Royal Medici family took place in the march. 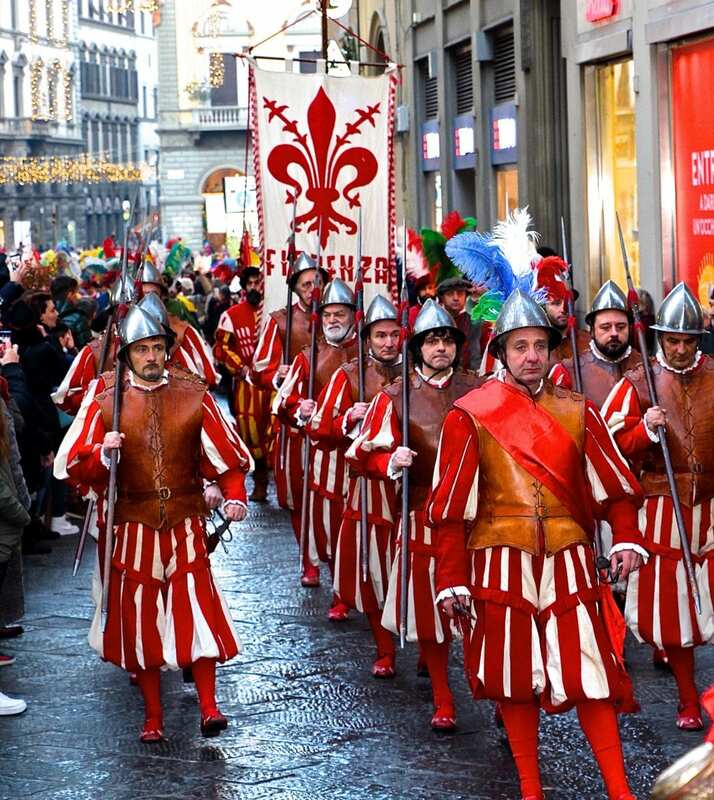 However, when they were kicked out of Florence in 1494 the parade seems to have stopped until 1997! When the Duomo had its 700th birthday, they decided to restart the famous march and has been going ever since. Over 500 people from all over Italy come to join in the parade of Florence.